Several of Metro’s busiest routes are scheduled to be upgraded to RapidRide before 2024, while several others will get speed and reliability improvements but without the RapidRide branding, according to the agency’s latest Capital Improvement Plan (CIP). As Metro and the City work out what they can actually deliver and on what timeline, that level of investment is coming into focus. The CIP targets four Seattle routes for RapidRide treatment between now and 2024: Madison BRT, Metro Route 120, Route 7 and Route 67 (Roosevelt-Eastlake BRT). That those four rose to the top shouldn’t come as a shock. Madison BRT is fairly far along in planning and is a marquee project for the city, both route 120 / RapidRide H and Route 67 / Roosevelt-Eastlake are in various stages of the design phase, and the well-used Route 7 is an obvious contender for any high-profile improvements. The remaining three routes identified in the levy (the 40, 44, and 48) will still see speed and reliability improvements, but we shouldn’t expect RapidRide branding or amenities like off-board payment on these corridors in the near term. “The [seven] RapidRide lines Seattle identified remain in the Metro Connects vision plan, and upcoming and future CIPs will clarify how and when those routes will be implemented,” according to Metro’s Jeff Switzer. Switzer confirmed that funding is available for electrifying the 48, though a timeline has not been established. SDOT already put in the poles when it rebuilt 23rd Avenue several years ago. Outside the city limits, Metro is moving forward with three additional lines by 2027: A RapidRide version of Route 169 (Renton-Kent-Auburn), to be designated “RapidRide I,” a Totem Lake-Bellevue-Eastgate line, and an unspecified “East or South King County” line. We had high hopes for RapidRide+ when the levy passed, and while the retrenchment is unfortunate, it’s good to see Metro and SDOT moving forward with 4 high-quality lines that show what RapidRide can be, rather than implementing all seven in a more uneven manner. Even without the red buses, however, exclusive right-of-way can and should still be prioritized: creating a transit-only lane in Seattle right-of-way doesn’t require fancy buses or shelters, just the desire and political will to do it. In light of branding & marketing ineptness by local agencies, let’s get a head-start now and save ourselves confusion by renaming the “i” Line to the J-Line. That’s right, the letter may slip too, as well as the timeline and budget. I don’t know how long these letters will stand around waiting to be implemented. If it were a patent you’d have to implement it in a few years or lose the patent. The Latin alphabet didn’t get J until medieval times, so it’s possible it might lose I, and maybe JKLM too. I think this has more to do with the fact that letters like I, O, U, and Y are easily confused either visually or verbally with numbers or words. That’s one reason the NYC Subway doesn’t use those letters for any of its route bullets. I and O can be easily confused with 1 and 0. I (capital i) can look like capital J or lowercase Ls depending on the font or handwriting, which is why Washington DC’s lettered streets skip over ‘J’ for Jay and its ‘I’ Street is sometimes written intentionally as Eye Street. The region is facing branding confusion hell. Each operator brands how they want. This is going to be apparent once ST brands lines by colors (like Community Transit) and has single letters denoting each color (like KCM RapidRide). Riding RapidRide B to the blue “B” in a circle for Link to the Blue line for CT will be very confusing at the transfer points. Even color shades fade on signs over time. What should “B” mean? I noticed that Boston MBTA has now joined WMATA by having two letters like “BL” and “GR” to clarify line colors, by the way. What to do? PSRC should put a branding committee together to stave off this confusion. A few days of committee work now will prevent having thousands of confused riders in the future until we are left spending millions to fix the confusing signs soon to be installed. My preference is to use the German approach – a letter describing the service then only numbers after that. Colors can be used — but should be a secondary branding tool. I see “R” for arterial bus rapid transit or Rapidride (R1, R2, R3, etc) and L for Link (L1, L2, L3, etc). Sounder train lines would be “T”, ferries would be “F”, streetcars would be “S”, express buses on freeways would be “X” and monorails would be “M”. I’d support other branding schemes as well — as long as we get regional consistency across all operators. Here, here! Add to the confusion 405 “BRT.” Do we need yet another branding just to call it BRT when it’s not really BRT (Madison Rapid Ride will be closer to BRT!)? If we go with this approach, X405? Or X405S and X405N if it’s broken up at Bellevue? We do seem to be getting to the point where we have enough variety of service types for the self consistent German system. Heck, I’d make all the ST Express buses one letter and one or two digits if it were up to me! The 594 would be the X94. For the BRT, i would suggest calling then by “X” too. By using “X”, ST can even use X1 through X9 because there is no route between 501 and 509. I suspect the éventail service on 405 will end up being operated as more than one route and likely to have segments off of 405 anyway — so I don’t think making a Route 405 as the 405 BRT route is very useful (but that’s a whole other topic). This branding issue should be resolved very soon though. Projects are moving ahead and it’s better to decide now for the next generation of services than to change it all after the branding is on the street. All ST BRT lines are on highways with limited stops, so just calling them express lines would be fine. ST and Metro have already muddied the distinction between limited-stop routes and long nonstop routes by lumping the 550 and 373 and former 7X together with the 578 and 216. But this will collide with ST’s desire to draw a distinction between BRT (frequent with enhanced ROW and stations) and ST Express (neither). Although… that is the same distinction as Metro is making between RapidRide and Frequent. So should ST BRT be called RapidRide? I’d call it Swift because it’s closer to that. Yes, the PSRC should consolidate the branding. But are the cities and counties prioritizing it? Not at all. In the Tacoma Link feedback I made it a point to say that the branding will collide when Central Link and Tacoma Link meet at Tacoma Dome Station, and two different levels of service will have the same name. The ST rep said that Tacoma Link’s phase 2 branding is still undecided and it could become something else. But inertia. A central body to formalize transit branding is exactly what we need. The highways department figured that out long ago (with a national committee under AASHTO dictating Interstate/US Route numbering) and it’s high time that it’s done here as well. I don’t think the lack of RapidRide branding has to do with the lack of red buses (it’s quite common to see a regular bus on a RapidRide route, the only real downside being the single back door), but I think it has more to do with the lack of off board payment. Though I think it may be better to start with off board payment on a stop basis than a route basis (like how third avenue is getting off board payment for all buses to mitigate the closure of the tunnel to buses). That’s really where you’re going to see the most gains. Off board payment on a 44 stop with 2 or 3 people waiting helps somewhat, but it helps tremendously at major areas with many people waiting for multiple routes. Metro has a somewhat convoluted threshold for RapidRide. Part of it was the requirement to have a distinct brand for federal grants, and SDOT is apparently focusing on non-essential issues like off-board payment and red buses rather than speed and frequency. So rather than roll out a RapidRide without some of the jazz, it’s just incrementally upgrading routes incrementally to unspecified levels. And that’s the problem, “unspecified”. RapidRide comes with a guarantee of 15-minute service until 10pm every day and some ROW improvements. It’s important to not fall short of those, and it’s important to have reassurance that they will happen. That’s what RapidRide provides: the reassurance. And visitors are benefitted by thick red lines on the map. the 36 is amazingly frequent now: I sometimes see two or more while waiting for a 7 or 14. But how would a visitor know that? Maybe there needs to be a category for “almost RapidRide”. As Alex said, no one cares about the red buses. But off-board payment improves speed. Sometimes a lot more than bus lanes. It is no less essential than any other improvement. Not that much. I ride the B, E, 10, 49, 62, etc with some regularity, and except at the major stops like Bellevue Transit Center or 4th & Pike, most of the stops have one or two people getting on/off. The difference between swiping an off-board reader and getting on at the front door and swiping an on-board reader is so small it’s practically zero. Most bus stops don’t have thirty people getting on and slow-tapping like they’re dancing the Montegues and Capulets at every run. And it’s tap vs tap, not cash vs tap. Off-board readers make no difference for the real slowpokes who fumble for coins. You don’t need 30 people at a stop for off-board payment and all-door boarding to pay dividends. Just yesterday afternoon in a SB 62 at Dexter and Galer, about a dozen people got on. No one paid cash, but we still dwelled for a good 30 or 40 seconds. All-door boarding would’ve cut that at least in half. I’d say you start to see real benefits with as few as a half-dozen riders at a stop. If you want to talk examples, though, consider the 41. Ride it sometime in the evening, towards Northgate. Metro is spending money to have officials at some of the tunnel stops to take payment, and then let them board in the back. It speeds things up considerably (which is why they spent the money). Mike, ‘way overdue to ask this, but your mention of SDOT’s presence, let alone its making operations decisions shows I haven’t been paying attention years. I thought matters like fare collection belonged to KCM. Is RapidRide really same creature as the streetcars? Buy whether they are or not, has transit in general have a single friend on the City Council? Or was Transportation Coalition just a stepping stone? Not kidding around. I like Rob. But is anybody at all on the Council even mentioning any transit agency, or its perfomance, or its operating needs, by name? Seattle owns the streetcars and outsources to Metro to operate them. The RapidRide lines will be Metro routes but SDOT is contributing the capital costs for bus purchases. and the street arrangements were always SDOT’s anyway. Some of the RapidRide corridors were in Metro’s mind already, as can be seen by earlier attempts to restructure and consoldate service there. In other cases Seattle strong-armed Metro into putting them into its long-range plan. Metro was not in favor of an all-Madison RapidRide or the restructure proposal to convert the 12 into 1st&Madison-Madison Park route; it preferred the 11-and-12 concept or a Broadway-Madson route instead. But because Seattle was willing to fund the capital cost of an all-Madison route it agreed to incorporate it. Metro was also not in favor of either the SLU or First Hill streetcar routes, both because streetcars cost more than buses and divert operating funds from more routes, and because the streetcar’s short termini split the corridor and require parallel frequent buses to overlap them and continue beyond them. Though I think it may be better to start with off board payment on a stop basis than a route basis (like how third avenue is getting off board payment for all buses to mitigate the closure of the tunnel to buses). Yeah, I think that makes sense, but I have no idea how that is supposed to work. In general, I don’t know how off-board payment works within our system. Does someone check the fares or is it just the honor system? Assuming you have a fare checker, then it makes sense to use this with buses that are popular. That is why it is probably most cost effective to have off-board payment for the most popular stops on the most popular buses. That is the way open BRT would work (outside the BRT section riders would still pay the driver, but inside it is like boarding a subway). That makes sense for our system. The big question I have is how the city will handle fare enforcement for relatively unpopular buses that happen to run on Third Avenue. Maybe they aren’t worried about it — they just treat every bus there the same. If that is the case, then you are right, I could see the city focusing our off-board improvements towards stops, rather than buses. Currently off-board payment exists only on RapidRide and it’s proof of payment: you must have an ORCA card or transfer receipt to show the inspector. At shared stops with both RR and non-RR routes the readers sometimes have a sign saying “Tap for RapidRide lines only”. Seattle wants to move to complete off-board payment on 3rd Avenue (or at least off-board tapping) but it has given no hint of how this would work operationally or what the rules would be. Can a route be proof-of-payment when it has both stops with readers and stops without readers? Will fare inspectors patrol all routes? Will they be present only near downtown? Does that mean if somebody enters in the back door downtown without paying and doesn’t get inspected within Center City they’re home free? Of course, with Metro reducing fines and deemphasizing inspection rejects due to pressure to serve the poor, the distinction may become academic. Can a route be proof-of-payment when it has both stops with readers and stops without readers? Sure, but I’m pretty sure the E, for example, doesn’t have a reader for every stop. I think that is why the Metro map for the route (https://kingcounty.gov/depts/transportation/metro/schedules-maps/e-line.aspx#route-map) calls some stops “stops” and other stops “stations”. The ones called stations have readers, the ones called stops don’t (e. g. https://goo.gl/maps/7rbat3DZxvx). Will fare inspectors patrol all routes? Yeah, I would imagine so. Will they be present only near downtown? Yeah, I think so. For a lot of routes, it makes sense to check fares as the bus leaves downtown (since that is the area where folks could get on without paying). Does that mean if somebody enters in the back door downtown without paying and doesn’t get inspected within Center City they’re home free? Yeah, maybe (the Free Ride Zone lives again!). I don’t think it necessarily matters. Cities that have gone with all off-board payment have actually seen fare evasion go down (see the previous link). Studies have shown (sorry — don’t have a link) that fare inspection does not have to be very high to work. Most people will simply pay, while others simply need the fear of being caught (not the certainty) to set them straight. I agree, though — I think a bigger problem is cash fares. But it seems like having off board payment goes along with that. You’ve added the big box that allows you to pay with an ORCA card, it seems like you should also add something that can take cash (or credit) and spit out a receipt to ride the bus at the same spot. As with the ORCA reader, you don’t need to have that at every stop, but at the ones where cash payment tends to be high. That would mean that a “station” not only allows you to pay off-board, but requires it. Oh, you’re right. RapidRide “stops” don’t have ORCA readers or real-time signs, so you have to enter at the front there. But it’s still proof-of-payment, so drivers always give a receipt for cash payment rather than offering an optional transfer. I think I remember from years past that Toronto made at least some stops Proof of Payment, and designed them accordingly. What if we put pass-through fare gates on the sidewalk side edge of the platform. Might really help with fare enforcement Downtown at least. But could be worth it for the rest of the system too. Might be good idea to keep thee POP area under camera surveillance. Electrifying the 48? Won’t Metro be well on its way towards a predominately battery-electric bus fleet by the time that project rolls around? Maybe, maybe not. SDOT has hedged its bets on vehicles for Roosevelt RR, saying it would look at what the state of the art is closer to procurement time, so it may be trolley buses or battery buses or something else. Most of the 48 already has trolley wires for the 43 and 4; so they only need to fill one or two mile-long gaps. This project involves planning, design and construction of the Battery Electric Bus (BEB) charger(s) in support of potential use of battery electric buses on the Madison/G Line. Based on testing and more extensive review of the feasibility of 60-ft battery electric buses on this steep route, hybrid buses may be used to open this new RapidRide line and the charging infrastructure may be delayed until industry technology can reliably be used on this route. When feasible, the new chargers will be capable of charging battery electric buses and be located on the bus route and/or at a Metro Base. The project includes new infrastructure, switchgear, and new power service to the charging sites. If the problem we’re strictly a matter of funding, raiding the streetcar budget seems like the obvious solution. But, in many cases, I suspect it’s all going to come down to drivers not wanting to lose their lanes or parking spaces. As wonderful as it would be for the 44 to run on dedicated bus lanes through the U district, past projects haven’t given me a lot of hope that SDOT would actually be able to get such a move through the Seattle Process, once people start complaining at public meetings about the impact to their car commute. Bus lanes on 45th would also have the side effect of improving the pedestrian environment by adding separation between the sidewalk and motor vehicle traffic, at least when there’s no bus coming. The bus lanes would also be used as desired facto bike lanes, on a street that currently has none. Yeah I live one block off of the route (where it’s 46th) and was looking forward to potentially fewer lanes. It would make it easier to cross at non-signaled intersections, which is a pain now. They should also adjust the light at 46th and Phinney. I have missed many buses waiting to cross because the light cycle is so long on 46th. I’m sure there are lots of similar improvements needed in Ballard. There really is no streetcar budget to raid. Right now we don’t have money to spend fixing it. If we do nothing (and abandon the project) it won’t allow us to shift money, it will simply be that we don’t need to come up with as much money to build it as we would otherwise. asdf2, for everything car-related from street parking to massive sprawl, I think there’s a law of physics that’ll finally transit-orient reality. The stipulation that no more than one thing can be in the same place at the same time. Right now, a lot of curb parking still thinks it’s moving. But sooner or later, time will when not a single auto is mobile. About which not a single driver any longer cares. So you’ll have a lively imperceptibly moving street that people can walk on and off for hours or days. Leaving a bus lane or light rail track or grooved along side the road for both for people when anybody really needs to travel. Also, app system of attendants who will roll your car on or off at stations along the rail line, where they leave you off and pick you up. With or without your car. Real first step will be extremely natural in its most direct sense. I think that first big marketing breakthrough will appear when vans and back seats start featuring drapes, sheets, large pillows and Do Not Disturb signs on doors. And Good To Go covering giving record box office for remake of One Flew Over the Cuckoo’s nest. Where evil Nurse Ratched is portrayed as a sweet lovely woman instead of Louse Fletcher’s vicious psychopathic hospital administrator who was really more my type. Which is real reason I’ll always use new 80 mph Tacoma Link next lane over and advocate emergency temporary joint use when 2008 goes into Chapter 2. Or is it 7? Wow, for an editorial staff that has been quick to criticize the current administration, you sure are letting the old one off easily. You make it sound like it is “just one of those things”. They had it all figured out, but prices went up and Trump got elected. What are you gonna do? The agency acknowledged those problems in April, but they’d festered internally for about a year before that, a citizen oversight panel found, not becoming public until Mayor Jenny Durkan took office and ordered a review. But on other issues, the blame lies firmly with the agency and with those who designed the levy — former Mayor Ed Murray and former SDOT Director Scott Kubly. Sorry folks, but this was a case of an administration simply lying to us. They knew they couldn’t deliver what they promised (well before the vote) and said nothing, only for the new mayor to discover the problem. My how short people’s memories are. We haven’t had a Seattle mayor not purposefully deceive the public regarding transportation projects since before Rice, likely before Royer. This is quite literally The Seattle Way, and has been since before there was a DSTT. Durkan is just as disingenuous as Murray was, and linking to the Blethen family mouthpiece only supports my point. Maybe, just maybe, you should quote something other than the sketchiest, most bias news source in the state before you criticize the position of an administration. But right now all I see is coal calling the kettle black. OK, you are calling a Pulitzer prize winning publication the most biased news source in the state. You are ignoring the real wall that exists between the often reactionary editorial staff and the news desk. More to the point, where is the bias in that article? The article was simply reporting on the oversight committee’s report. If you feel like the conclusion of that committee is substantially different than that reported by Mr. Gutman, please explain why. The quotes are from the oversight committee, not from someone at the Seattle Times (you get that, right?). Are you saying the oversight committee was biased, and purposely is blaming Murray and Kubly? You think they just made all that stuff up, and the Seattle Times shouldn’t report back their findings? Seriously? Oh, and is CrossCut similarly biased when it reported the results of an internal survey (https://crosscut.com/2018/08/after-cronyism-accusations-sdot-promises-do-better-employees). Weird that SDOT itself doesn’t deny the accusations (and promises to do better) given all of the biased journalism you think is slamming the flawless folks at SDOT. A Joy, might help your own credibility if you give at least one example of Mayor Durkan’s dishonest approach to transit. Mark Dublin- How about claiming the new streetcars won’t fit on the tracks? Also, don’t forget about the current mayor’s findings about the funding deficits, for operations, of the two existing streetcar lines that is now going to be “reconciled” in the city’s new (proposed) bi-annual budget. I think the prior mayor and his administration was far from transparent about multiple matters. What other Seattle-led transit projects have been so misleading, or even half or a quarter as misleading? And I don’t count Link or the initial RapidRide (A-F) because they weren’t Seattle-led, and any influence Seattle had on them was in the minority. Link placement and initial Rapidride weren’t Seattle led? Who did lead them then? Link placement south of IDS is awful due to Seattle demands. An entire station just for sportsball? Seattle lunacy. Putting Rainier Valley Link stops on the spine rather than on a Kent/Auburn spur? Even The Stranger new better in the 1990s. Mass transit to TIBS or points south is more frequent now, but it is slower, even at peak rush hour. This is not the Link South King County wanted, deserved, or needed. South King County Link directly suffers due to demands made in and by Seattle. Rapidride A was also a complete fiasco directly demanded by Seattle. Seattle demands on the initial Link line were so bad that after securing additional funding they still couldn’t afford to get Link to the airport. To cover their behinds they split the 174 in two at TIBS (another thing South King County didn’t want) and formed Rapidride A from TIBS to Federal Way. The change resulted in delays and overcrowding for the A, due to an increase in passenger numbers (mainly at TIBS, due to the forced transit hub). Since this is being done on the cheap (remember, this is about covering Seattle’s behind, not actually serving South King County), rather than increase service or look into bus lanes, they put the route on a stop diet, cutting the number of stops by over 1/3rd. People in Seattle are beginning to demand a luxury subway between two communities only 2.2 miles apart (Ballard and U District) before any meaningful light rail progress can be made with ST4. Let’s also not kid ourselves. I’d be willing to bet or even eat a Bernie Utz hat we won’t get to Everett and Tacoma city limits with ST’s money. Look. Seattle is the ecobomic powerhouse of Washington state. We get that. We get more in tax money than we give, and you make up the surplus. But that doesn’t excuse the way Seattle treats the rest of the county in terms of mass transit. Seattle is not a city of Scrooges, and we are not Oliver Twist. Yet we are thrown bones and told to enjoy the gourmet marrow. The disingenuous gaslighting is uncalled for. Link and early Rapidrides were conpletely driven by Seattle, and used as wedges to diminish the transportation quality outside of Seattle. That you cannot see that gives me little hope that this will change. I apologize for for my audicity in deigning to address a citizen of the Ivory Tower City. I will now rejoin my fellow plebeian masses living outside Rome. Link placement south of IDS is awful due to Seattle demands. An entire station just for sportsball? Seattle lunacy. Placing a mass transit station is pretty commonplace, both here in the US and around the world. With 81 M’s games, 8+2 Seahawks games and 17+ Sounders games per season, we probably have one of the better utilized sport-related stations around. It would have been lunacy to not build the Stadium Station. Look. Seattle is the ecobomic powerhouse of Washington state. We get that. We get more in tax money than we give, and you make up the surplus. But that doesn’t excuse the way Seattle treats the rest of the county in terms of mass transit. I would talk to the County about that. Seattle doesn’t have any say in what the County does or doesn’t do in regards to mass transit. In actuality, it comes down to the other jurisdictions treating mass transit as if it’s taboo. RapidRide A and B were both completely out of the City limits, so I don’t know how those were “completely driven by Seattle”.. C, D and E essentially took existing Seattle bus routes, painted them red and added off-bus payments, following protocol for the first two lines. Your post has the factual accuracy of your typical anti-Seattle MyNorthwest commenter. Is it just that you hate Seattle and will say whatever it takes to make that clear? I thought we were talking about lowballing expenses and cost overruns, not alignment designs. That’s the norm in the US. And pleasing billionaire team owners and helping their business is high on Seattle’s priority list. Why did the South King and Pierce boardmembers not say a peep when the Georgetown bypass was deleted from ST’s long-range plan in 2014? Apparently South King County considers it completely unimportant, and much less important than extending Link to Federal Way and adding a Burien-Renton line. That’s totally BS. The A was South King County’s part of Transit Now. not Seattle’s. It terminated at TIB because ST/Metro tend to conflate transit centers with P&Rs, and if TIB is a great P&R station it would be a great RapidRide transfer too. Terminating the 124 at TIB rather than SeaTac was a bad decision but I’m sure that was Metro’s; I can’t see Seattlle saying, “Don’t extend the 124 to the airport.” If you’re concerned about breaking the 174’s one-seat ride to Des Moines and Federal Way, I say that’s ridiculous. I used to ride the 174 and it took one and a half hours from end to end, and delays anywhere were magnified across the entire route. If you’re talking about losing the 194 or Link being slower than it; that’s another topic. It’s ten minutes slower but more frequent and reliable. Twenty more seconds is insignificant compared to the number of riders and Rainier Valley mobility it will gain. If the station were in Des Moines I might agree with you. That’s more than BS; it’s ludicrosity. South King County and East King County got the first two RapidRide lines; Seattle didn’t get any until the third year. That was to avoid giving the appearance of favoring Seattle. And Link being Seattle-driven, have you read nothing that RossB writes about what an urban-centric subway system would look like. (Hint: Several Seattle lines; stations in Summit, 15th & 23rd; a line serving Belltown, First Hill, and the CD; Renton before Federal Way, etc. The fact that Capitol Hill has one station, First Hill has an ineffective streetcar, and Ballard-Tacoma preceded 45th or Lake City shows that this was a suburban-dominated process. I don’t know who Bernie Utz is but if Link terminates at Federal Way and 128th-or-Ash-Way, it would still be a pretty good benefit. Not going all the way to Tacoma Dome and Everett Station doesn’t mean there wouldn’t be frequent express-bus feeders to it. You also realize that ST has subarea equity, right?. The South King Subarea is distinctly separate from Seattle, which is in the North King Subarea. I don’t know the politics behind ST going with subarea equity, but it probably had to do with the non-Seattle representatives being paranoid that Seattle was going to keep all the ST revenues for themselves. As we knew beforehand, and it still rings true, the population centers generate the tax revenue. Once you cut the less urban areas off of that teat, their revenue start to dry up, as South King has noticed. Of course, that doesn’t stop them from finding some way to still blame Seattle. So Seattle is getting their infill stations and talking about “luxury subway lines” because, without the rest of Puget Sound mooching off of them, their subarea is flush with the revenues necessary to be able to talk about and implement these types of things. I can’t wait for the day that someone puts a constitutional amendment in front of the people to implement subarea equity for Washington State tax revenues. The pro-crowd will only need one slogan to get that amendment passed in a landslide: “Keep your tax dollars out of Seattle!”. As for Link’s priorities, all the suburban subareas ganged up on Seattle and insisted on “subarea equity” because they were afraid otherwise Seattle would take the lion’s share of the initial funds and build a RossB-type network and never get to Lynnwood or Federal Way. Believe it or not. FWIW, North King includes Seattle, Shoreline, and Lake Forest Park. South King includes all of South King County except Renton, which is in East King. The boundary between Seattle and Burien-Tukwila-Skyway zigzags but it’s partly along SW Roxbury Street (100th) and S Wallace Street (118th). Just out of curiosity, for a newcomer, if the 174 was split at TIBS and the southern half became the A Line (I think I’m reading that right), which current route is the descendant of the other half? If it still exists, at least. Not the 124, is it? And where did it start? 1980: The 174 went from downtown to Federal Way on highway 99, E Marginal Way, 4th Ave S. Local only, no all-day express. 1990: DSTT opened. 194 created as an express from the downtown tunnel to the airport and Federal Way. 1996: 577 and 578 created as even faster expresses to Federal Way. 574 takes over some of the 194’s south-of-airport commitments. 2008: Link opened to TIB, with SeaTac following six months later. The 174 is split at TIB into the 124 (northern) and 174 (southern). 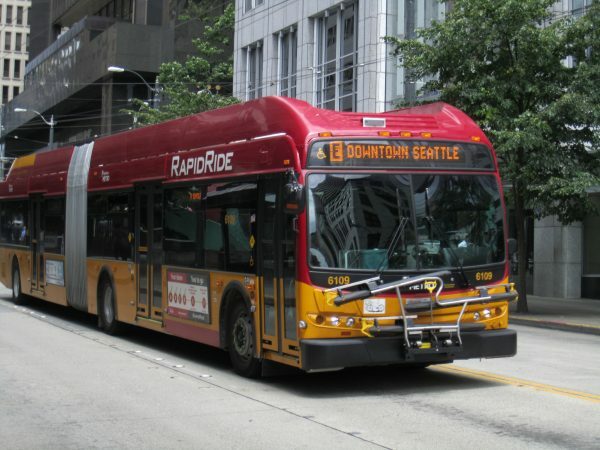 2010: RapidRide A started, replacing the 174 (TIB-FW). 2018: 124 extended to airport during night owl when Link is not running. This avoids a long and sketchy transfer at TIB if your flight is late. Ross, just found these pics from a trip to Eugene years ago. Could be useful. Eugene runs buses same caliber as RapidRide, doors on both sides. But this seems to be a simple and inexpensive solution to guiding tires so bus has no problem positioning doors just right for wheelchairs. Seems to work well for doors on either or both sides. Let’s keep it in mind. Weird that they are calling the Roosevelt/Eastlake project “route 67”. It seems like it is most like route 70. The convolutions of this project make the terminology confusing and hard to remember right. Originally it was billed as “Roosevelt BRT, replacing the 66, to 45th or 65th or maybe Northgate”. Then the 66 was deleted and the 70 was increased, so now the 70 is the closest route. And Northgate has been decisively chopped in the first phase so now it covers only a few blocks of the 67. So now it’s properly the successor to the 70 but sometimes people forget that, especially because it’s called “Roosevelt RapidRide” rather than “Eastlake/Fairview RapidRide”, which it really is. So is the 70 being eliminated post-RapidRide conversion? Will the 67 be truncated to its Northgate-Roosevelt segment or remain as a local shadow to the RapidRide south of 65th? @MIke — Yeah, but keep in mind, the 67 doesn’t go downtown, while the 70 does. Even if the new route went to Northgate, I would still call it a “stretch 70” instead of a “stretch 67” since the 70 covers a larger portion of the overall route (and clearly the most important). @Pat — Hard to say what will happen to the 70, but I think it will change. With Link providing the key connection (U-District to downtown) I think the days of a one seat ride from Eastlake to 15th NE are probably gone. Folks will have to walk a few blocks to catch the new RapidRide, or make a transfer via the 49 (which may not go downtown and be eventually turned into a RapidRide run as well). That is pretty much what Metro has in mind for the long run (http://www.kcmetrovision.org/plan/service-map/) and it makes sense to me. Roosevelt RR and the 67 will overlap between U-District Station and Roosevelt Station. The 67 has to go to a major transfer point/destination, and SDOT decided to extend RR to the second option, 65th. There’s some confusion about shadows and stop spacing. As I said above, the best practice for local routes in 0.25-0.5 mile spacing (and some would say 0.25-0.33). Historically Metro had much closer spacing, with stops every two blocks one some routes (and still on NE 65th Street and others). So a “stop diet” that consolidates these to 0.25-0.33 miles is merely rightsizing them and doesn’t necessitate a local shadow. Limited-stop routes like Swift and the 373X and former 7X have stops every 0.5-1 miles. Link is mostly like that, with stops mostly every 1-2 miles in Seattle.That’s the point where you need a local shadow for in-between stops. In the Roosevelt area Link will stop at 37th, 44th, 65th, and 108th. That clearly leaves out all the trips I outlined above, even if it had been aligned along Eastlake rather than Montlake. So Link needs a local shadow, and that’s what the 70, 67, and 106 are. Another best practice is to terminate at a major transfer point/destination rather than terminating a mile or two short of it. So the 67 must go to U-District station, where the state’s largest university and the city’s second-largest urban center are. Terminating at 65th would create a stupid gap and depress ridership. That’s exactly the problem U-District Station is causing now: there’s a gap between it and the U-District (and 65th), so people have to transfer to an extra short shuttle to bridge the gap. But that is temporary due to budget limitations, and was never intended to be permanent. Yeah, I don’t know about that. Between 65th and 45th, Roosevelt RR will serve as Link’s local shadow, since it doesn’t sound like there will be any stop consolidation in that stretch as there aren’t that many stops anyway. Roosevelt Way is pretty desolate between about 50th and Ravenna Blvd, so having ultra-frequent service by keeping the 67 there seems kind of pointless. Unless there’s a major rezoning plan for that stretch or for Maple Leaf that I’m not aware of, just run the 67 between Northgate and 65th (where the Link station *will* be a major transfer point) so the two dozen people who live in Maple Leaf can get to Link. With the arrival of North Link, the 67’s utility decreases considerably anyway. I live in Roosevelt, and the stretches of Roosevelt Way between Trader Joe’s on 47th (or more charitably, the library on 50th) and Ravenna Blvd, and Safeway (75th) to Northgate Way effectively don’t exist in my mind except as a place I pass through while walking or on the bus. The only people inconvenienced by truncating the 67 at Roosevelt Link Station are people in Maple Leaf heading to the U District who are robbed of their 1 seat ride. It’s unclear whether Metro originally intended RapidRide to be limited-stop with local shadows like Swift, but after the Eyman initiatives and the dotcom recession it said it didn’t have enough money for that and that RapidRide would be the only route in those corridors. In that case it’s a judgment call whether the stations should be closer to 0.25 or 0.5 miles, but community pressure convinced Metro to go with 0.25 miles in the Oak Tree area (85th to 105th on the E), and the city of Shoreline convinced it to do the same for all the intersections it had designated for urban villages. Grids and no overlaps are generally better but we shouldn’t go overboard. Some people have suggested that the 7 and 36 should terminate at Jackson, and people can transfer to the streetcar to get to Intl Dist or Broadway. That’s way over-pedantic. Routes should go to major destinations/transfer points. And I’ve recently become convinced that downtown routes should go all the way through downtown and terminate in the adjacent neighborhood. (That’s the argument for terminating the D and 40 in Pioneer Square, and the 26/18/131/132 and 24/124 and 5/125 and 21/33 through-routes. It’s efficient to serve all those overlapping trips within downtown and across downtown rather than terminating all routes at Pine Street.) The worst thing is when you have to transfer twice within a mile, as somebody going from North Rainier to St Mark’s Cathedral would have to do if they had to transfer from the 7 to the streetcar and again to the 49 to continue going straight. When there’s a major institution like UW with 50,000 students and staff, and half the bus riders are going to it, it makes sense for the bus to go one more mile rather than force a pedantic transter. The problematic one-seat rides are those like the former 42 and 25, and the 66 had some of that also, where the resources that could have made a nearby parallel corridor more frequent are squandered by a miles-long coverage route. that’s also the argument for deleting the 150 and 101 (saying they’re redundant with Link), although those are much more borderline cases, and Metro has come down firmly on the side of keeping them as all-day expresses to downtown. It’s only a pedantic transfer for the handful of people in Maple Leaf, a tiny fraction of the 50K people trying to get to UW. There’s no housing density there, and it being mostly zoned single-family makes me doubt there’s a large student population there. Is Maple Leaf a big bedroom community for UW faculty the way Ravenna is? Anyone from Northgate or SnoCo looking to get to UW will just take Link. Anyone south of 65th will either take Link, the new RapidRide, or route 45 if it still exists in its current form. There aren’t enough people in between to matter. You’re arguing about twenty blocks. And that “handful of people” is still denser than most of the suburbs, and within the density that Europe would have a frequent route to a major destination/transfer point. It is rare that you really need a shadow, especially with a bus. Is the shadow to serve an area that is several orders of magnitude smaller? Then sure, yeah, that makes sense. But if all you do is force a significant number of riders to schlep their way to a stop or take another (less frequent) bus to transfer to that bus, then my guess is you are doing it wrong. Unless you are building a very long distance line (a city to city line) then it makes sense to build bus routes that don’t require shadows. This means that you shouldn’t have mile long stop spacing for your frequent routes, but it also means that you don’t have to stop every two blocks. You’ll notice that the E follows that basic pattern, and it doesn’t have a shadow (it doesn’t need one). Meanwhile, the Roosevelt corridor is an urban corridor, not a long distance, suburban one. The Roosevelt HCT project will simply end at 65th. It would make no sense to skip stops between 45th and 65th, since so many people would be hurt, and only a handful (those close to the end) would benefit. I really don’t see any shadow benefit from any other bus route. What I do see is simply added service along a fairly densely populated area. The Roosevelt HCT will be great, but it won’t run every couple minutes. My guess is it will run every ten minutes all day long. That is good, but obviously has room for improvement. Furthermore, it runs on Roosevelt, which is a bit farther away from the UW. Not so far as to justify a detour (especially since you are have to get back to Roosevelt) but far enough away to prefer it, if that is your destination. That means that a secondary bus (like the 67) headed to the UW makes a lot of sense. But as I said earlier, I really don’t see the 67 looking anything like it will after Link gets to Northgate. As Pat said, anyone from Northgate looking to get to the UW will just take Link. Why have a bus that goes on a horrible button hook — a bus where one can alight, walk a few blocks, smoke a joint, put it out and then catch the same exact bus? That makes no sense. Build a grid, which means running a bus down Roosevelt, and also running a bus on 5th. As to which buses end at Roosevelt and which buses continue to the UW, that is a tough call. When I made my map, I only ended a couple of buses at 65th. Because Mike is right — the UW is a great location, and it is only a little bit farther. What I did, though, is send only the buses that were heading west on 65th over to the park and ride. Other buses (like the one heading down Roosevelt) would just keep going on towards the UW. Here is the thing about that map, though. I don’t see any dogs. I don’t see any route there that doesn’t have something going for it. With all due respect, Pat, the bus you are outlining looks like a dog. A bus that starts at Northgate, loops around, then ends at 65th? Who would take that? If you are at 65th or Northgate, you just take Link. If you are just trying to get to Northgate from Northgate Way and Roosevelt, you have lots of other buses (75, 347, 348). The only people who use that are folks along the very corridor we all feel is pretty weak (Maple Leaf) and only if those people are headed to Northgate or Roosevelt. Yes, if it is the only option then those folks will take it, but that just isn’t a good route. Half of its route is redundant, and the other half is weak, with only Roosevelt as its anchor. Given the time it takes to run the route, there wouldn’t be enough ridership to justify decent frequency. In comparison, the “new 67” (which is essentially a hybrid of the old 73 and 67) works for a lot of people. Anyone along that corridor (which includes a lot more than Maple Leaf) would take that if they are headed downtown or to the UW. It is faster than the button hook 67, while doing a much better job in terms of coverage. Another issue is that a truncated 67 would have the problem of very short routes. I checked Metro’s LRP and it’s still expecting Roosevelt RR to go to Northgate, so we don’t know what it will do now that that’s been chopped. It could go to 65th, or to the U-District, or remain through-routed with the 65. There’s a good chance it will do the latter because Metro has been very happy with that combination. There’s a continuous urban village starting at Roosevelt and going through the U-District and the UW campus to U Village, and Metro may want to build on that rather than breaking it up into pieces. And even with the 65-Shoreline CC extension it would be not much longer than the 5, which itself is through-routed with the 21. Metro’s recent position seems to be that major urban corridors need more than one 15-minute route. The 45/71/73 overlap on University Way, effectively two frequent routes. The 67 meet at 65th & Roosevelt, then diverge at Ravenna Blvd with the 45 joining the 71/73, then at Campus Parkway the 67 (65) joins the 44 and 48 to UW Station, and then joins the 75 to Children’s. So the area with multiple frequent-route overlap is bordered by 65th & Roosevelt, 11th & Campus Parkway, UW Station, and Children’s. That’s the same area as the continuous urban village I mentioned earlier. I understand why they are prioritizing the particular projects, but this stinks. I could care less about branding, but off-board payment can make a huge difference in terms of overall speed. But that costs money, and if we don’t have it, we don’t have it. Paint is relatively inexpensive, so we might see more BAT lanes. It will be interesting to see if Metro/SDOT moves the 44 as suggested (sending it to Children’s instead of the university). If they can get the BAT lanes (which again, shouldn’t be that expensive) then it seems possible. Of the four projects that are moving forward, making the 7 faster seems like the one that could benefit the most from buses with doors on both sides. According to the study (and Frank’s article), we could get a “33% speed improvement in the corridor” if both the 7 and existing streetcar run in transit-only lanes on Jackson. If they lack money for the special buses, then that could kill that important improvement. Those sorts of improvements can be made later, but it is a shame to do it twice. Ross, it seems to me buying buses with two sets of doors is much more expensive than running buses contra-flow so right side doors can still handle center platforms. I can see need for both higher lane barriers, and extra control for signalling. Since the stretches in question are effectively busways, so I’d go with stricter lane reservation. I don’t want regular traffic to even think about getting between two buses. This is a “mind’s-eye” kind of decision. But we’ve got a precedent for testing. When we were laying out the DSTT, we’d take a line of buses, I think about a dozen, and rented Seattle International Raceway for an exercise using orange cones to mark out lanes and stations. Think we’ve got closer places for tests on this decision- but it’s best way to make the decision. Also helpful for working out the systemwide signals we’re going to need. Because, unspoken here, best routing, speed, and capacity are absolutely going to need some rubber-tired train-control. Because to me, DSTT’s worst waste in speed and capacity owed to refusal to use the fortune in vehicle control left lying for 28 years eleven days ago. Damn! Shame on me for letting that anniversary get by me. Well, research is going to have to be light on stats and strong on memory. Will go for shortest keyboard-time I can get. DSTT as intended has too many lessons to shrug off and dump all of them in same closet as those signals. But three or four lined up and dispatched as a single group reallycould take care of the capacity problem. Fact that the Russians did it first is a recommendation. Looks like a lot of destuction still hasn’t stopped it yet. >> Ross, it seems to me buying buses with two sets of doors is much more expensive than running buses contra-flow so right side doors can still handle center platforms. I think the big problem is safety. It would be very confusing, and my guess is someone would get hurt. In general my understanding is that the big problem with the buses is not having doors on both sides, but building electric ones that are really big, and can get up the hill. The extra doors really aren’t more expensive. If the operation creates left-right-left-right vehicle lanes like what happens with contraflow, then it would seem that having two lanes for buses on one side and two lanes for traffic would be better (if there was room for a pedestrian island). Then the pedestrian signaling could operate as an independent signal cycle. The bus lanes become like a two-way bicycle track. Is the city actually thinking about someday maybe possibly putting transit lanes on Jackson? What is “the study”? I found something called the “Levy to Move Seattle Work Plan Assessment Report, April 2018” but I didn’t see anything about Jackson Street in it (or any other specific transit/BAT lanes anywhere). It is referenced in Frank’s article: https://seattletransitblog.com/2015/12/21/rapidride-the-corridors/. So basically, go to that link, and then follow that link to find the original report (I shouldn’t have called it a “study”). I guess technically it is an addendum to the transit plan. Since the tracks are already there, wouldn’t take too much time, would it? I know it’s down the road but I live in Auburn. This South King County Rapid Ride like the 169? Isn’t the 150 a better candidate too. The 169 does not go to Auburn. Auburn Way to Central in Kent than to SouthCenter finally Downtown seems like a good candidate for Metro. I think it compliments Sounder well and is faster than Link for most of Kent and Auburn even after Link comes farther south. That being said 169 is prob a good choice but I don’t ride it because I go to Seattle more than Renton. They want to combine two of busier corridors together that are in the Kent Valley from what it sounds like (180 from Kent Station to Auburn Station, and 169 from Kent Station to Renton) I’ve been on both, and they’re fairly busy routes throughout most of the day. It’s in Metro’s long-range plan as a RapidRide line from Renton TC to Auburn Station (106/169/180). Southeast Auburn is on a separate Local route (Auburn-Lakeland Hills). For the 150 Metro envisions an all-day Express (half-hourly) on downtown-Kent-Auburn. (That is probably to address the long-unrequited clamors for a Seattle-Kent express, and to replace the 578 in Auburn.) It’s unclear from the map whether it would stop in Renton (maybe) or Southcenter (probably not). But the 150 itself would remain in 2025, and in 2040 converted to a Frequent route on Kent-BAR- Rainier Beach. Yes! The “1056” RR route identified on the Move Seattle plan would have been a nice route to shuttle people to the light rail as well as connecting multiple shopping and housing centers along Kent Kangley as well as multiple community colleges. I really hope both of these (the 1033 RR too) get built. amend to RossB. Also, why do the agencies give so much credit for the Madison planning to date; suppose they were hitting the wrong nail all that time? if the mode is to change, perhaps the alignment should as well. Note that routes 40 and 44 are within the same planning area as Northgate Link, opening in 2021. both agencies should strive for short transfer walks between frequent bus lines and Link stations if they are close. So, per RossB, why not brand Route 70 rather then Route 67? Madison BRT missed Capitol Hill Link, the DSTT, and attempts to go through a congested I-5 interchange. both councils have to approve the networks and budgets. It’s the right nail, precisely because it misses Link and needs an alternative. Getting some kind of priority transit to First Hill is not an option but a necessity. The 40 and 44 don’t rise to that level of criticalness. First Hill has large hospitals, residential towers, a huge amount of infill develpment, and it takes half an hour to get from 3rd to Broadway on the 12 and 2 in rush-hour traffic and with all those turns. Roosevelt RapidRide will replace the 70 no matter what it’s called, the same way East Link will replace the 550. There’s no question about that: they won’t run almost-identical routes in parallel. The 67 will remain because “Roosevelt RapidRide” doesn’t address it and it’s a growng corridor. The new zoning for the U-District puts Roosevelt at the center of density west of 15th, and I know from living there for 18 years that a lot of people travel all along Roosevelt-Eastlake and it’s likely to become a major urban village in a decade that will need lots of north-south transit to places Link won’t reach. Yesler Way and 8th/9th avenues is a much better corridor to connect First Hill and downtown; it has no I-5 congestion; that pathway would serve the three largest employment markets directly (e.g., Harborview, Swedish, and SU) as well as growing Yesler Terrace. Madison is too difficult and costly; funds are scarce. It has been shown in many plans but not implemented. Yesler will have the 3/4. A dense area like First Hill probably needs two corridors, especially with the number of elderly/disabled people who can’t walk far to another bus stop. Yeah, what Mike said. Madison BRT makes a lot of sense, and will be great if they get the buses. I know it isn’t perfect, but being able to get from some, say, 15th and Madison to 5th and Madison all in your own bus lane (not BAT lane, but 100% bus-only lane) is pretty cool. It is hard to imagine a trip like that working via the pattern you suggest. Maybe if Link had a lot more stops, but it doesn’t. Seriously, how would that work? A bus has to somehow get you from 15th and Madison over to the station, then you walk into a deep tunnel, wait for a train, ride it a couple stops and come back out of the tunnel, walk up the hill — all for a trip that is about a mile. Meanwhile, what would a bus network look like if you did that? Keep in mind, as great as CHS is, it is not at all convenient for buses. The main problem was that there weren’t enough stops in that area. There is a reason why the restructure struggled so much after putting in the station. There simply wasn’t enough added from a network standpoint to create something that dramatically changes the region. But that won’t be the case once Madison BRT goes in. Now you have a fast, frequent bus that is comparable to Link. Not for long trips, obviously, but for a short trip (which is all this will do). A lot of time is spent going into and coming out of the deep tunnels that make up Link. I’m not saying we had any great alternative, but for trips of less than a couple miles (which is entirely what this is) you might as well transfer to the bus. By building a fast, frequent BRT line on Madison, we alter the dynamic of the region. We make it possible to leverage the line, and change the nature of transit in the area. If you look at the Metro plans for 2025 (http://www.kcmetrovision.org/plan/service-map/) you can see something that basically resembles a grid. Just click on the “Frequent” checkbox and you can see it. It isn’t written in stone — lots of things can change, but what it provides is dramatically better for the area. It manages to not only create a grid, but a grid at two levels (a Picasso grid, if you will). Of course many of the features in that restructure could occur without Madison BRT, but like the addition of Northgate Link (which includes three great stops) it is made more likely with Madison BRT. Two great stops. For me, the long-delayed U-District station will always be viewed as part of Central/U-Link plans. Yeah, it really should have been built that way. It probably should have been the first thing we built (U-District to south downtown). It also should have included a First Hill station. And the steep hill. Many people at 24th NW, 3rd NW, and Latona NE will be willing to walk to Link rather than wait for a connector bus, but would find the steep Madison hill too much to ascend. I think faster buses are always great. I think more frequent buses are great on heavily-ridden routes. My issue is that I feel that we are spreading service too thinly while making token speed improvements to elevate a route to RapidRide “status”. Most of the first six corridors have very wide stop spacing and there are many segments with bus lanes and signal priority. The concept appears to almost be a rubber-tired rail system. That’s important because there are transfer choices, land use decisions, expected minimum frequencies and hours of service and many other things that come from that. Taking a local route and improving stops and a few speed enhancements is great. Still, at what time does it deserve being called “RapidRide”? To me, the default should be stops at least a half-mile and preferably a mile apart — so that signals and streets can be operated to make the bus much move quickly. Anything less and we have watered down the concept to have almost no significance to the riding public. That’s what the city is saying: it’s focusing on Madison and Delridge and becoming vague about the others. Madison and Delridge clearly deserve RapidRide: they are two of the densest corridors with many low-income/elderly people that Link obviously left out. RapidRide C was almost on Delridge instead of Fauntleroy, and a ridership/equity-balanced approach to West Seattle would have put Link on Delridge to White Center rather than Alaska to the Junction. Of course it’s a judgment call whether the city should go even further in diverting RapidRide capital to more widespread incremental improvements, but the city is going at least partway in that direction. Sorry, man, but no. Just no. The whole point with the “BRT” or “BRT-light” thing is to build something similar to a subway, even if it doesn’t carry as many people. Would you want to build a subway with stops a mile apart as the default? Of course not. You want urban stop spacing. You want the thing to pick up as many people as possible, so that you can justify the cost. Unlike a subway, the extra stop doesn’t actually cost you much. What you are basically talking about is express bus service, which is great, but a different beast. Things like off board payment aren’t a big issue with an express bus, because you have far fewer riders per mile. With express buses it is often all about getting bus lanes, and sharing it with a whole bunch of buses, not a single, particular line. BRT type service is not like that. Why do you think the E is so darn popular? It is fast, despite all those stops. It is extremely frequent. Off board payment exists in the most popular stops. It all adds up to a system that serves lots of people, while providing them with reasonably fast, frequent service. Just about any trip along that corridor makes sense. Adding even better frequency is justified, because there are so many riders. Take out half the stops and you’ve lost a lot of riders. Suddenly the frequency has to go down too, because your farebox recovery isn’t good. Next thing you know, it is just an ordinary, OK, express bus. Sure, the ride is faster, but you are waiting longer to get on the bus. Just to be clear, the detour to serve Linden should be removed, but getting rid of a lot of stops so that the bus can go a mile without stopping is a bad idea. But yeah, I hear you with regards to branding. Frankly, I think the branding thing is meaningless, especially since there is very little, if anything, that makes RapidRide unique. It used to be off-board payment, but with changes on Third Avenue, buses like the 24 will have that. For a while those buses were a lot more frequent, but now we have a bunch of buses with similar frequency. Just to be clear, it would make a lot of sense to brand things to highlight a bus route like the proposed Madison BRT, which really is different in terms of its frequency and speed (despite urban stop spacing). But now that other buses have essentially caught up to RapidRide, I think the designation is largely a waste of time. I would much rather we just live with the largely meaningless RapidRide designation than see us make these routes faster, but far less effective. As d. p. used to say, they would be really fast if they didn’t pick anyone up. I think you are missing my point RossB. Most bus routes should have closer bus stop spacing — just not BRT routes. – It’s hard to design signal priority for more than one stop ahead. That’s important because pedestrians have to often cross busy streets to get to or from a stop and you can’t cut pedestrian countdown signals short. – People can get frustrated if a bus stops more than about 12-15 times. That’s a reason why express and limited bus routes exist! I actually see it as a semantics issue. Calling every route getting modest speed improvements a “RapidRide” defeats the intent of the service type. Call them enhancement projects; not RapidRide. It depends on which transit market you’re trying to serve. Germany and New York have close stop spacing (0.5 mile) so it replaces a local bus, and the grade-separated nature gives some of the benefits of limited-stop service. But not all the benefits, because New York also has express trains stopping every mile or two. London doesn’t have express trains so you just have to sit through the slog. (Or take the less-frequent and more geographically-limited regional trains if they fit your trip.) In contrast, Russia’s stop spacing is 1-2 miles like Link, so it really serves as a limited-stop service, and if you’re going in between you transfer to a streetcar or trolleybus. Both of these models are viable, and make different kinds of trips very convenient. RapidRide can’t have wide stop spacing when there’s no local overlay, and there’s not enough money to fund local overlays without eliminating frequent service in many other neighborhoods. There’s an interimable debate on what qualifies as BRT. It goes back to that two-level division I mentioned above. Is it to make local routes more frequent or to add an all-day limited-stop service that didn’t exist before? There are good arguments both ways on that. It’s useless to try to shout down everyone else’s BRT criteria to establish yours. It’s better to use a continuum like the BRT standard and state what level a particular service is, and give up on declaring whether that service meets some ideal BRT threshold or not. Of course, the BRT standard does not make this easy because rather than saying, “Silver level requires A, B, and C”, it says, “Silver level requires some level-of-judgment combination of A, B, and C”. But it’s left as an exercise for the reader to determine what level RapidRide, Swift, and ST BRT are on the scale. Of course, but that doesn’t mean that they make sense as the only BRT line on that corridor. Again, I point to the E, the most popular bus in the state. Do you really want mile long stop spacing? It is pretty easy to imagine (45th, 85th, 105th, 125th, 145th, etc.) and pretty easy to imagine it being terrible. Do you have another, more popular bus take up the slack? In other words, is your shadow more popular than your “BRT”? That doesn’t make much sense but it sound like what would happen if you did that. Yes, Mike, there are plenty of places in the world where mile long stop spacing makes sense. There are plenty of spaces where you have a mix — a lot of stops clustered together, then big gaps. The E has that big time. No one wants to put a stop at the Aurora Bridge, and I’m not sure the Lynn and Galer stops are worth it (especially since they can be covered by other buses). But by and large, the most successful subway systems in the world have stops close together, because that is where the people are. Yes, it is irritating as the train (or bus) makes stop after stop getting to that distant location. But guess what? That is how you get riders! When there is a subway that makes stop after stop and an express that magically goes to the distant location, the subway carries way more people. Each and every time. If you want to build both, then great, be my guest. But don’t destroy the thing that has been shown to work (urban stop spacing) just to favor a handful of more distant riders. By all means, run an “Express E” that skips most of the stops. Fine by me. It is actually what the BRT folks (ITDP) recommend. Just don’t ruin what has made the E quite popular — the fact that it has lots of stops. Oh, and I agree with you, Al — the RapidRide moniker is meaningless. That really isn’t news. We have been saying that for years, and it is more true now than ever before. So what? If anything, it means that the steps they took have worked. We are making more RapidRide-ish routes, and they work. Add a lot of frequency, get off board payment, a little paint where it is needed most and we get a lot more riders. But now Seattle (and it is just Seattle) wants to take it a step further. With Madison, the plan is not to just build something that is “pretty good”, but something that is really good. Much more frequent than the E — in fact, more frequent than Link (at least right now). Six minute all day service (and that is just for starters). Meanwhile, you have just about as much right of way granted to the bus as is possible. Should it have a different label? Frankly, I don’t care. I think the three points that ITDP gives agencies for branding is three too many. Build a really fast bus system and you really don’t need special branding — people will figure it out. I have a friend who lives in North Shoreline and takes transit to Downtown Seattle. He prefers other routes than RapidRide and uses it as the default. He will even prefer to change buses at Northgate unless it’s just not timely. Trunk routes are very important. Local routes are very important. BRT ideally should be an alternative bus to travel longer distances faster, like a light rail line. It’s a typology thing. It’s akin to the days when the FAA used to require cross-country planes to make repeated short hop routes in the 1970’s. Rapidaride kind of warps that. I fully expect opening Link through Shoreline will result in a loss of RapidRide long-distance riders there. Because it’s the fastest north-south route in north-central and northwest Seattle. And there are a lot of business destinations along Aurora. That’s the point. People going from Aurora Village or Highway 99 in Snohomish County should have something faster than the E. I think the E should lose a few stops to bring it up to 0.5 miles but it still has a valuable purpose for trips within north Seattle/Shoreline or transferring from the 44 or 45, which its current stop spacing serves. In any case, the hope is that both Link and the E will have greater ridership than the 512 and E, or another way of saying it is that the riders defecting to Link will eventually be replaced by other riders. When Swift went in it turned the 99 corridor from the highest-ridership route in Snohomish County to the two highest-ridership routes in Snohomish County. Metro positioned the 49 that way too, hoping that the riders lost to Link would gradually be replaced by other riders. Jumping in here to support 0.25-mile stop spacing for local buses and 0.5-mile spacing for Rapid Ride or express/BRT buses. BRT spacing can go to 1-mile in suburban areas lacking destinations between stops, such as RR-A and the Swift Blue line. But if development occurs, infill stops should be added to bring the average down to 0.5-mile. When MAX green line opened, ridership on the sorta-parallel 72 increased slightly rather than decreased. Overall network effects could just as well carry over to the E when Link opens. I’m looking at the route map. The route crosses MAX in several places. A difference with RapidRide E is that there is no proposed extension a mile east to the Shoreline North/185th Link station. The E won’t directly connect to Link at the north end. That’s a flaw but it’s part of a bigger issue of 99 being parallel to I-5. It’s the same problem as Lynnwood, where 99 goes past Lynnwood TC but not close enough to it to be a viable transfer. The original problem seems to be the location of 99, because I-5 is where the Interuban was in Lynnwood. Swift solves this problem by going to 185th Station, and this will allow same-stop transfers between Swift and the E for continuing north or south on Aurora. Ideally the E would be rerouted to 185th or extended to Mountlake Terrace but Metro didn’t put either of those in its plan. And having both routes on 185th would be problematic because you’d have to cross the street to continue going north or south on Aurora. The net effect is that the E will be good for its primary purpose of going north or south on Aurora, and for transferring to it from Swift, the 65 (155th), or the 40, 45, or 44. That also has another parallel in highway 99 itself, where the expressway connects directly to 599 and I-5 at the south end but then ends hard at Winona (73rd) at the north end, like the prong of a fork. I hope electrifying the 48 happens soon! It’s already been delayed and if they have the funding for it why not do it now? They don’t have the funding now. They’re anticipating that the current taxes might bring in the necessary funding over the next few years. funding is about choices. if the CCC streetcar were dropped, the local capital targeted for that could cover the Yesler Way overhead, South Henderson Street overhead, 23rd Avenue overhead, and sidewalks on Aurora and Greenwood avenues North. No suburban MacDonald’s has ever turned out an edible fried Stetson, let alone a boiled Ultimate Hat. So as yet there’s no proof either way as to whether Jenny Durkan is lying about the pork pie one because the Jazz scene said Goodbye to them before the Mayor was born. So before you eat one, better check if the sell-by date is before or after 1946. Wrong way, we’ll know you’ve been writing copy for Scott Kubly. Before you end up in the ‘fridge at Saint James Infirmary. Sad, unfair and fake, but how else is New Orleans Medic One going to get a patient with fricasseed raccoon on their head to chill? Tank is in the picture is because it’s the reason Vladimir Putin is messing with our computers right now instead of with Finland. It’ll also run under our overhead, because if it has to fight in Russia, it’ll not only be able to handle security on their equivalent on the Route 48, but also keep I-90 clear of terrorists when we wire it to Ellensburg. Meantime, anybody know location of the streetcar in question, so we can measure for ourselves? My own tape measure says it was made in USA in 1943. So it can probably help solve the problem if somebody else has one from Finland. Also, if her predecessors left her a whole hard-drive full of lies, any chance the Mayor just hasn’t found them yet because they’re disguised as Netflix? Incidently abject apologies to the real Nurse Ratched for misidentifying her species. If I tell her weasels are cute if they have insane-looking blue eyes, a white uniform and a 1940’s hair do and freckles, even when people bring them on buses and call them ferrets…does Obamacare still cover lobotomies? By the clock on my laptop, date of this posting has been over for three hours. Writing bad Mad Magazine imitations wears on me a lot more than on anybody else reading it. But it’s generally an attempt, however lame, to keep from losing my temper in a way that’ll get me thrown off these pages. I don’t know Jenny Durkan at all. Will give her credit for getting into action on second day of an Administration that should’ve been prosecuted long before it took office . But she’s on my no-vote-ever list for putting some of my young neighbors a block from Angle Lake Station to intimidate friends against crossing her. We’ve all got our governmental inexcusables. Mine’s Government By Punishment, the better the stated intentions, the worse the offense. So no special brief for the lady. But a lot less for Advocacy by Accusation without a truck-full of proof. For sake of our own credibility more than anything else. Atmosphere surrounding her predecessor’s early resignation indicated that upon taking office, the Mayor’s first act of authority was to drain the cleaning supplies of the whole west coast. It’s also likely that her professional knowledge tells her that her preliminary findings could send somebody to jail. Or at least knowing that foreseeable future would make her chief working-tools a mop and a bucket of Lysol. Let’s all use our imagination on how each of us would explain truthfully to explain to our electorate what our nose is telling us, but that we can’t yet see. Unless she’s somehow to blame for what the last administration left her, what motive would she have to lie about anything? Let alone the time that somewhere has to include running the city. Also seems to me that in the slowest of times, a lot of figures change by the hour as new information comes in. I can’t see where she’d have any time to machinate anything. Let alone a motive. Awful as it is to think about- very good chance whatever’s happening in transportation, it’s nowhere near the worst thing her Administration is looking at. Seem to recall a sewage plant completely blew up in a very expensive neighborhood. Around the country, water supplies have started containing lead undiscovered ’til somebody looked. And general politics where one party has no ideas, and the other with only evil ones. I don’t see any signs whatever that Jenny Durkan hates the streetcar. Business community doesn’t. But what you love, you make sure it’s not going to fall through an antique street and have to be dragged out of a bootlegger’s basement. So my own take on Jenny and Transit does us some credit. Whatever’s wrong, we’re smart and capable enough to keep safely carrying passengers no matter what. While she deals with things a in a lot worse condition- inflicted by a lot sweatier hands. To me, here’s our best investigating and debating approach right now: the more justified the criticism we’re expressing, the more we deliver it as we’d want it expressed about us. When we ourselves know we’ve really screwed up.